Happy New Year! There have been a lot of changes in my life, thus the lack of updates. But what has not changed is my PR status due to the fact that I haven’t raced for a long time now and my temporary emergency work with Ebola at UNICEF, and quite frankly am coming up on 3 weeks of not running at all (winter storms, and the hellish process of moving!!!) so no PR’s to come anytime soon. But that’s ok, for once in my life my legs aren’t tired when I walk up the escalator to get out of the subway! 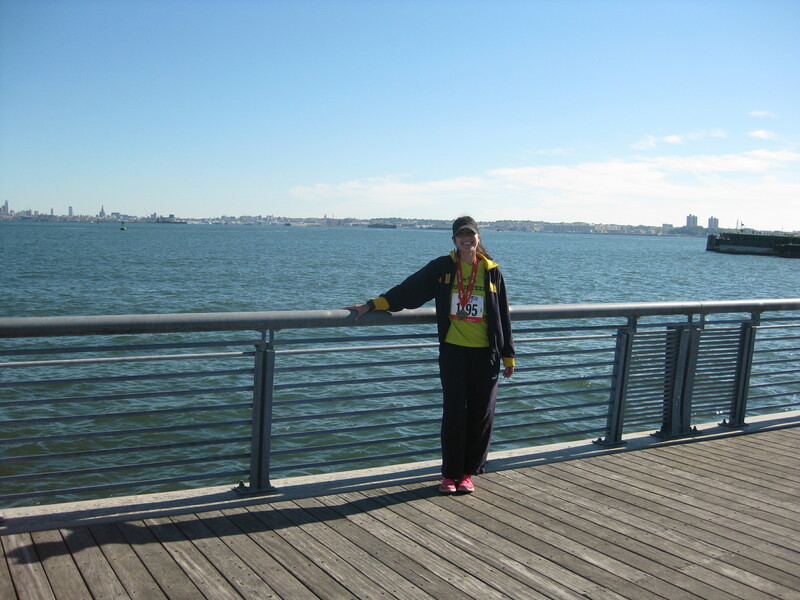 So back to my glory days….Staten Island Half!!! I don’t remember much of the race except that I felt GREAT. 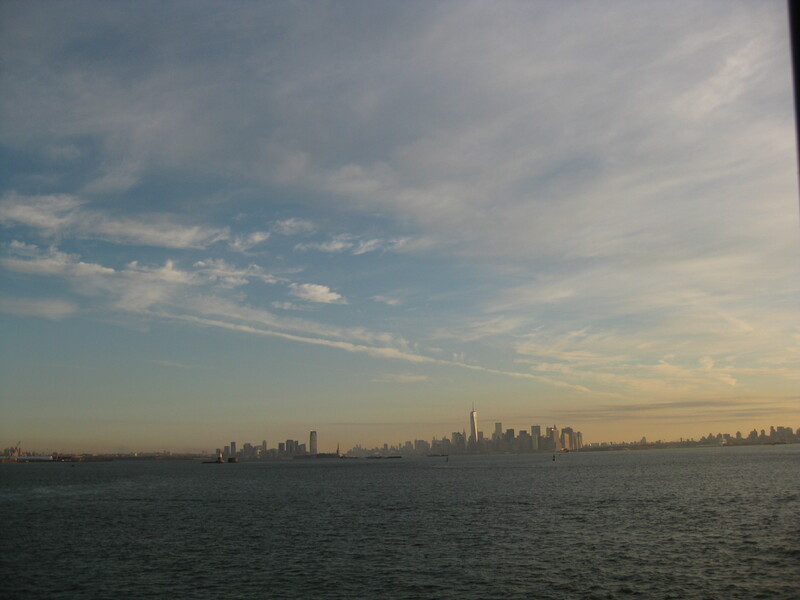 The morning required a super early wake up, a subway ride and a cold ferry ride, which ended up very scenic. 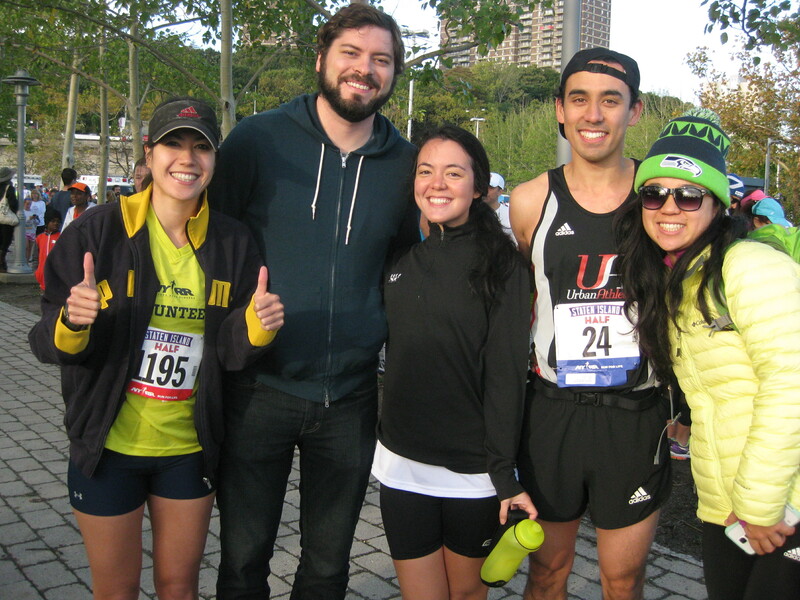 We met up with our fellow runner friends and shuffled off to our horsie corrals. It was kinda cold, especially for my wear, but I know I burn up hot and I just hate being too hot while I run, thus the aversion to the gym. 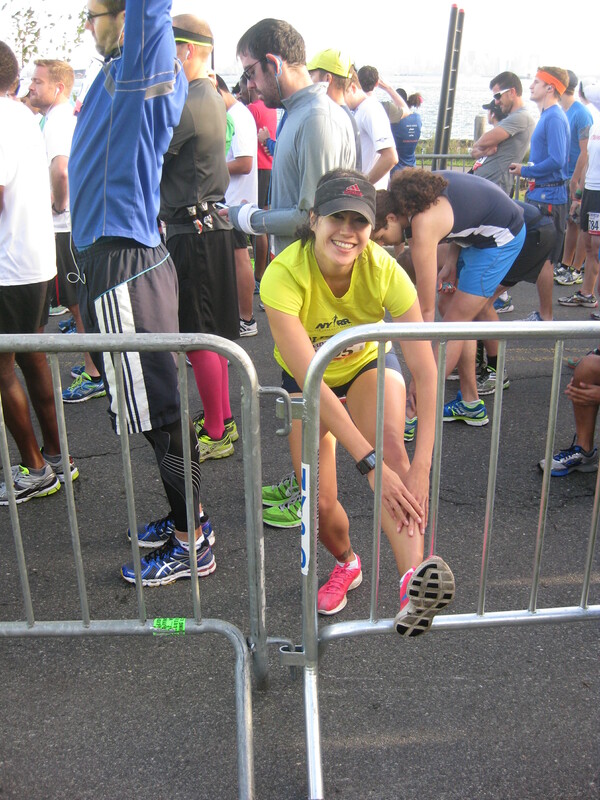 The corrals were really narrow but I wasn’t all anxious so I didn’t care. 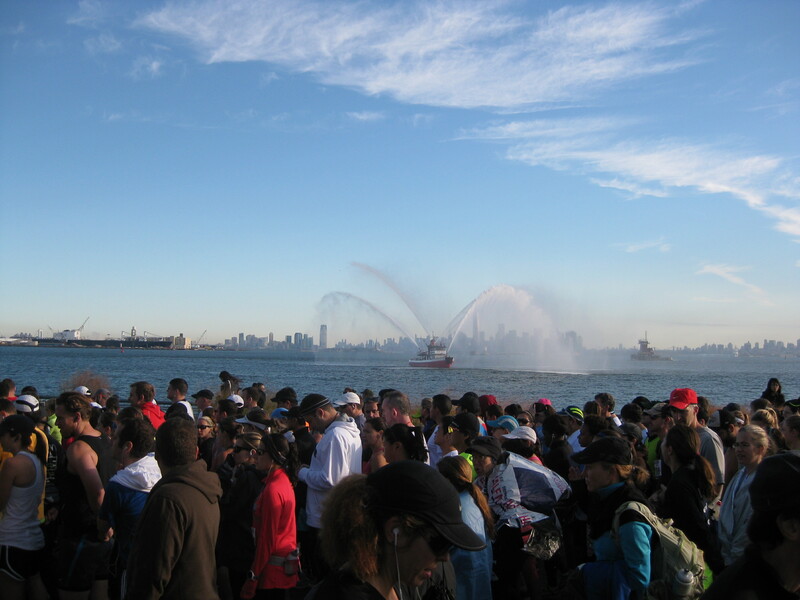 The race started, there were some fire boat fountains I missed because I was looking at not stepping in a pothole. Didn’t see this, thanks FBa for the pic! Off I went, just following the people, trying to get my groove. I thought for some sorta goal / motivation, it would be good to aim for hitting each mile around 7’30” pace. I think I did it, and was plus or minus just a few for the 1st half of the Half. There were definitely some steep downhills that made me go minus (yay) but I figured I’d pay back the time on the way back and it might be a lot worse since I would be tired. I tried to just remember to save something, making mental notes of what was where. Eventually the course did flatten out around mile 5-7 and there was a big out and back stretch. I saw Danny running on the way back and I yelled and waved and he yelled and waved. He was doing great! I kept going and was slowly passing almost everyone I encountered. Except one guy dressed in not really running clothes. He was wearing a sweatshirt or maybe it was tied around his waist, I can’t remember exactly, but I do remember thinking “I should be passing this guy” and I was not! Ha. Eventually I got back to the town area and the turns, with hills coming up, so I just tried not to let it piss me off or distract me. I was still doing pretty good! Then came the hills and I just tried to adjust so I was moving but not uncomfortably so. At that point I think I forgot how many hills anyway so I just tried to ration the energy left. I looked at my GPS watch and was defintitely going under 7’30” – and feeling pretty damn ok! So I thought, Ah, screw it – just for the heck of it, try to go for 7’00” for the rest (about 3-4 miles). So that was my new goal and I might have made some and sometimes not but I was a bit giddy about the fact that I was doing much better than 7’30”! 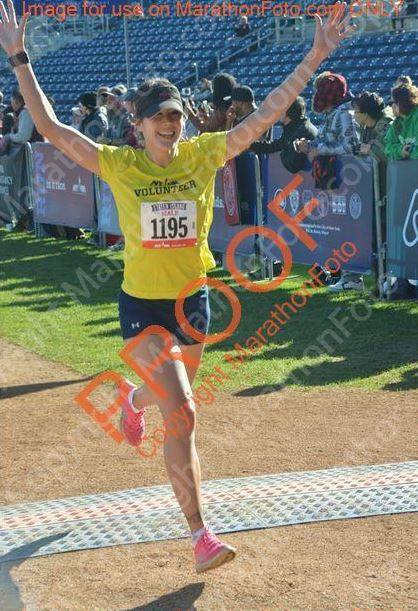 I think eventually I passed the strangely non-runner-dressed runner, or maybe I forgot about him, because I was getting happier and happier 🙂 and was really having a good time. I didn’t know where I was going exactly but people were cheering and I tried to just keep up my new pace. I came into a stadium and suddenly felt pretty exhausted but HEY I could see the finish! So I gave it some more and even raised my hands and smiled for the cameras! 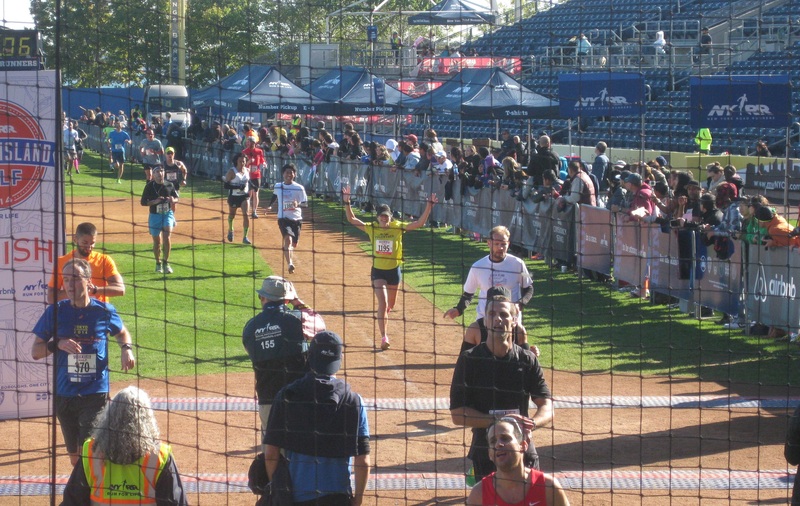 I was done and the time seemed to be…..a new PR!!!! Coming in to the Finish! New PR: 1:32:58 — at a 7’06” average pace! YAAAAY! I never had thought I could chip away at my time by more than a MINUTE, almost 2 min!!!! But here it is. Chipping away towards 1:30:00 dream time. I was (and still am) so happy. New PR, new medal, and now New Year, better get myself back in shape! 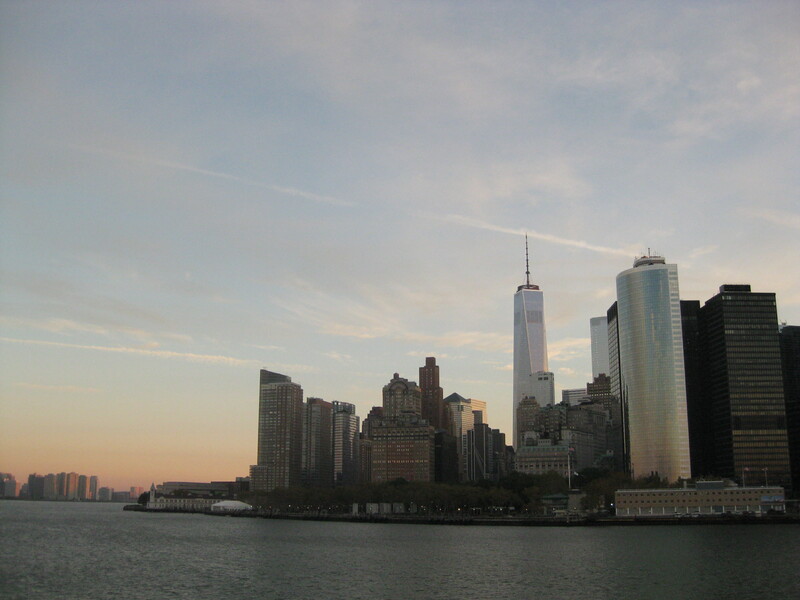 This entry was posted in Race and tagged 2014, 2015, accomplishment, friends, half, half-marathon, new year, NYRR, PR, race, racing, running, staten island, support by Blackfoot Running. Bookmark the permalink.